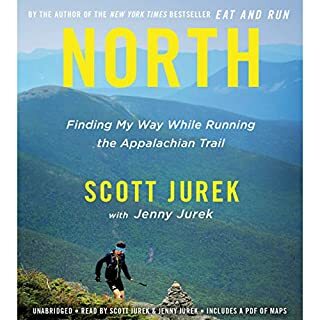 A dominant force in the sport of ultrarunning, Scott Jurek is a seven-time winner of the 100-mile Western States Endurance Run and a two-time winner of the 135-mile Badwater Ultramarathon through Death Valley. 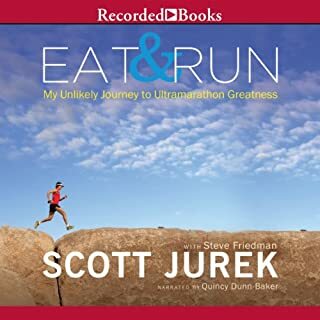 Eat & Run offers an inspirational account of Jurek’s life as a runner and vegan. Regaling listeners with jaw-dropping tales of endurance, Jurek also delivers sound science and practical advice—as well as his favorite plant-based recipes. 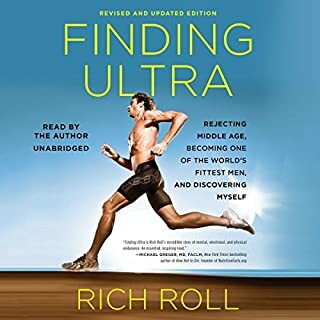 Finding Ultra is Rich Roll's incredible but true account of achieving one of the most awe-inspiring midlife physical transformations ever. One evening in 2006, before turning 40, Rich experienced a chilling glimpse of his future. Nearly 50 pounds overweight at the time and unable to climb the stairs without stopping, he plunged into a new way of eating that made processed foods off-limits and prioritized plant nutrition and daily training. Rich morphed - in mere months - from out-of-shape midlifer to endurance machine. Revised and updated edition with a new and original foreword and a bonus chapter. Ultramarathons don't leave much room for mistakes. 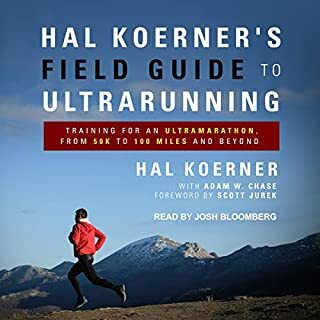 Don't learn the hard way: Get a jump on training for an ultramarathon with Hal Koerner's Field Guide to Ultrarunning, a comprehensive handbook to running 30 to 100 miles and beyond, authored by one of the most experienced and recognized athletes in the sport. After a decade-long addiction to crack cocaine and alcohol, Charlie Engle hit bottom with a near-fatal six-day binge that ended in a hail of bullets. As Engle got sober, he turned to running, which became his lifeline, his pastime, and his salvation. 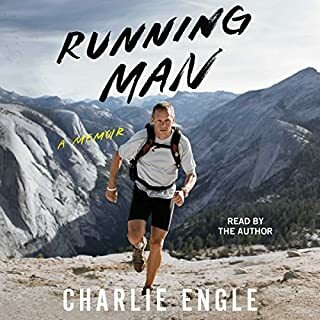 He began with marathons, and when marathons weren't far enough he began to take on ultramarathons, races that went for 35, 50, and sometimes hundreds of miles, traveling to some of the most unforgiving places on earth to race. Well read and highly entertaining! This revolutionary training method has been embraced by elite runners - with extraordinary results - and now you can do it, too. 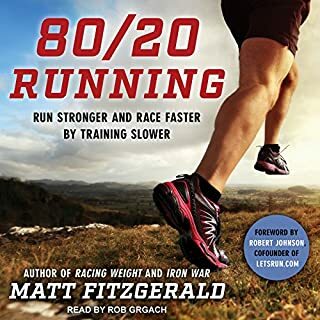 Respected running and fitness expert Matt Fitzgerald explains how the 80/20 running program - in which you do 80 percent of runs at a lower intensity and just 20 percent at a higher intensity - is the best change runners of all abilities can make to improve their performance. Marathons have become too easy for some runners. What was once the pinnacle of achievement in a runner's life is now a stepping stone for extraordinary adventure in ultramarathoning. The number of ultrarunners - those running distances of 50k (31 miles), 50 miles, 100k (62 miles), or 100 miles - is growing astronomically each year. To date, there has been no practical guide to ultramarathoning. 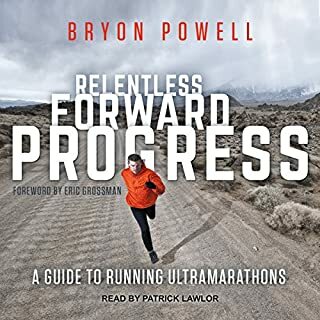 Now, Bryon Powell has written Relentless Forward Progress, the first how-to manual for aspiring ultrarunners. 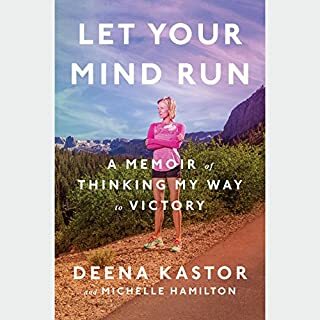 Deena Kastor was a star youth runner with tremendous promise, yet her career almost ended after college, when her competitive method - run as hard as possible, for fear of losing - fostered a frustration and negativity and brought her to the brink of burnout. On the verge of quitting, she took a chance and moved to the high altitudes of Alamosa, Colorado, where legendary coach Joe Vigil had started the first professional distance-running team. There she encountered the idea that would transform her running career: the notion that changing her thinking - shaping her mind to be more encouraging, kind, and resilient - could make her faster than she’d ever imagined possible. There's no other book like this. 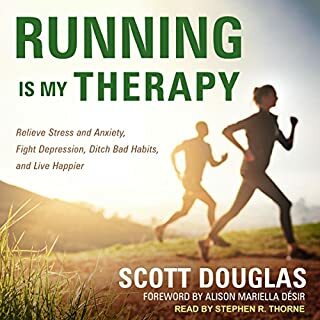 Longtime running writer Scott Douglas marshals expert advice (including his own, cultivated from more than 100,000 miles of personal experience), and a growing body of scientific research to show how running can make us happier. How? Everyone knows that running builds stronger muscles and a healthier heart; science now shows it also helps develop a healthier brain. For those struggling with depression and anxiety, a consistent running routine can enhance the mental-health benefits of talk therapy, antidepressants, and cognitive behavioral therapy. Great listen. Both motivational and hilarious. 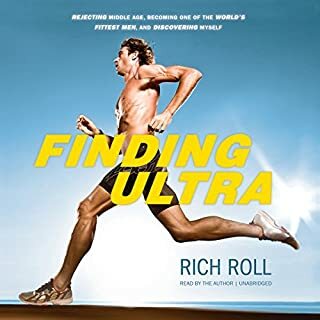 Featured in the best-selling book Born to Run, coach and performance guru Eric Orton has spent a lifetime learning and thinking about running and about the limitless possibilities of the human body and mind. 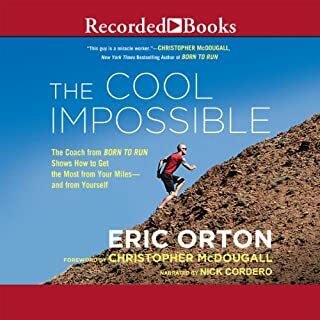 In The Cool Impossible, Orton shares his wealth of knowledge in an inspiring step-by-step guide that will open up a new world of achievement for runners of all levels of ability and experience. The truth is: Athleticism is awareness. That simple phrase is at the core of The Cool Impossible. Every once in a while a book comes along that changes lives. This is one of those books. The audio version is terrific! The narrator really manages to capture the spirit of the fast paced story without getting in the way. Highly recommended! Great story about the tarahumara, the ultra running community, and evolution of the human body. Great story, with caveats for the science. The author clearly writes well. The characters and narrative flow are great. 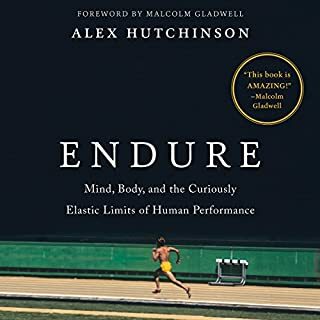 I genuinely ate this book up, even as a novice non-runner (I prefer obstacle course racing but had to learn to trail run). As a read, would 5 star recommend. The science is less clear. While I don’t doubt there’s a lot of overselling going on in the running shoe industry, present studies do not show a clear benefit of running barefoot or minimalist vs not (different harms from each, as the author does note, but the slant is clearly in favour); the inherent appeal of minimalism makes sense, but I’d like to see good science before deciding. All in all, this book was great. I just would advise caution in following some of the relative hyperbole word for word. At times I found it hard to listen to, but later realized I really enjoyed those parts that I wish were faster. Great performance and loved the story, especially the informative tangents. I'm really enjoying it. makes me think of why I run as well as my form and diet. This book was definitely an ear catcher. I was hooked to the concepts of ultra and keen to learn more. I think its a great place to start for anyone interested. Though i didn’t quite agree with everything in the book. it certainly held my attention and propelled my own search for more information, and inspired me to do my first ultra. Great story and very good narrator. Would recommend. It's got everything. Kept me paying attention the whole time. Great story. Funny, intelligent and thoughtful book with great people in the story. RIP Caballo Blanco . Legend. Highly recommend. loved it! everything was just great and I will listen to it again when I take the car just because the story is unmatched! The performance of the reader was very good and his imitations were great. And I'll never be one. But, I thoroughly enjoyed listening to this book. Loved hearing the history. And chia seeds have become a routine part of my diet. Educational without being stuffy. First, let me say that I hate running. HATE IT. 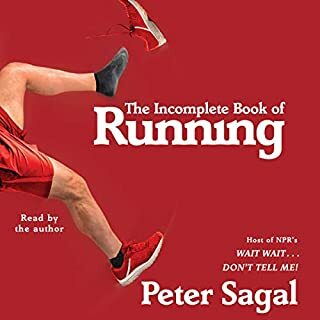 But after listening to this wonderfully written and masterfully read story I have actually begun the first steps of barefoot running. 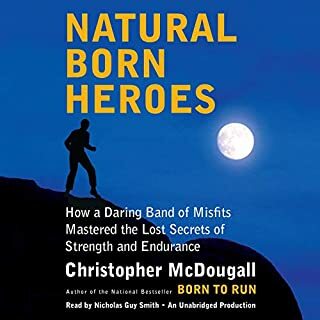 After listening to Christopher McDougall's adventures/misadventures in the Copper Canyons of Mexico with Caballo Blanco I have both a new-found respect and interest in running. 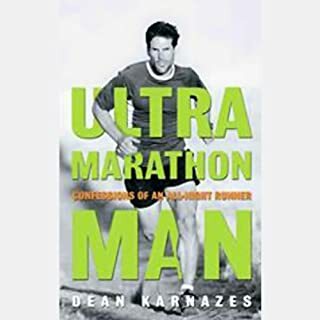 The book itself perfectly entwines great story telling, historic & scientific discoveries, and profound human truths all associated with the "art" of running. I've rarely been so satisfied by any book - I couldn't stop listening and I miss the characters so much I'm listening again. Awesome awesome awesome. Great book. My favourite type in that it tells a great story and gives lots of information. It makes you really question how helpful high priced running shoes and orthodics really are. Reading the book inspires you to go outside and run barefoot on dew-covered grass. it's an amazing book to listen to, first time listener and I hear it on the daily show so I thought I would look it up, too bad you can't get chia seeds to plan here in Japan, besides that is amazing book I can't wait to travel to Mexico and pick so me up ( don't tell anyone) I love the whole book so much I actually started running and signed up for the Tokyo Marathon next year, wish me luck! I have no idea what possessed me to buy this book but I am grateful to whatever force guided that click. I cannot remember the last time I finished a book and wanted to start over. This is not just a fabulous read but a fabulous experience. Fred Sander's voice is magnificent, Christopher McDougell is a beautiful story-teller. Born to Run is an amazing (true) story- intertwined with a little history, a bit about nutrition, curious facts about physiology and peppered with generous doses of motivation, spirituality, great characters and the beauty of unexpected friendships. Taken all together-it made me want to run (& trust me, I am so not a runner). Worth every second of the journey. What a great story. Not only great story, our author is major character and protagonist of and within the story. And herein lies the two major themes that make this one of the best books I have ever read. 1) Detailed and inside coverage of the Ultra Running Culture. Mexican (Tarahumara) legendary runners, strange (different/better) Americans. With a story how the two groups got together in the hidden mountains of Mexico for an EPIC race. 2) Detailed debunking of popular myths regarding running (especially useless and debilitating running shoes). As well as technical and deep mental insights of people who run and are addicted to running Ultra races. Perhaps (I mean why not) I could run a 50 mile ultra. I mean with the help of this book I am now running 20 miles along side the Colorado River (Glenwood Canyon). When I used to groan and moan to run 6. Finally and again the best story, documentary, training manual, inspiration extended quatrain ever anywhere. You see all the 5-star ratings because it's a great book. Just get it, and you will be happy. So many angles on so many things, I probably need to read it again. Some parts may be a little lengthy about some of the races for some people, but even as a non-runner, I found these parts rather enjoyable. The depth that the book goes into about evolution, shoes, feet, and endurance are what grabbed me. It made me think about what shoes I wear, and almost made me want to run (although I still don't). And it introduced me to a 'new' sport that makes me wonder- Ultras? 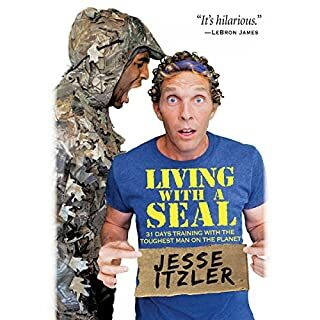 And then I found out that a friend of mine runs these 100 mile + races, and I felt I could relate in some way to what he does because I read this book. 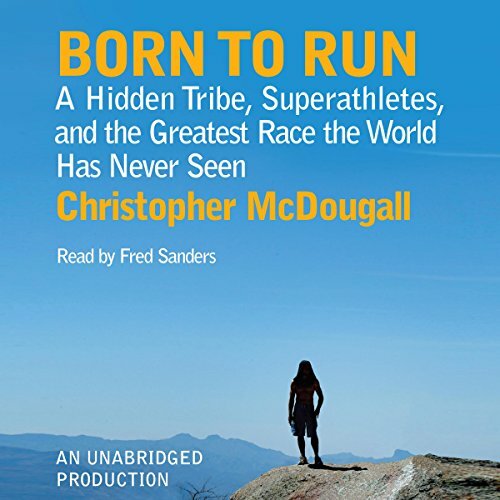 If, like me, you're not really a runner - don't let that fact steer you away from Christopher McDougall's new book. With an enthralling cast of true characters and a writing style that is laugh out loud funny... "Born to Run" would be a great summer road trip listen. 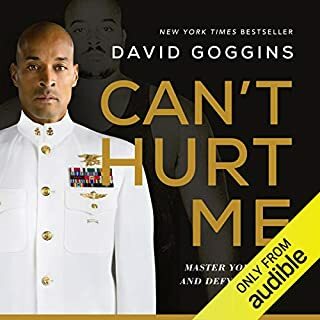 At least that was my plan for next week's vacation, but once I started listening, I couldn't stop (the narration was excellent). The story: well, I even was inspired to take my creaky, over 50 knees outside for a run to hear the last couple of hours... and that's sayin' somethin'. I hope the author saved a few stories; I'd love a sequel. My favorite part of this audiobook is what one reviewer called the "wonky" part. I loved McDougall's argument for and explanation of how modern humans evolved from running humans. This is an excellent listen. I highly recommend it for any runner. I have downloaded something like 70 audiobooks and this is the first one for which I have written a review. This book may be attacked by shoe companies, but more likely, it might lead to companies offering more minimalist running shoes. Born to Run was a very fun book to read, and full of amazing characters, but what I loved the most were all the nuggets of interesting and useful information sandwiched into the story (i.e. studies on the value of running shoes, the superfood Chia seeds, the backgrounds of successful ultra distance runners). I'm sure it starting to annoy my wife how much I cite things from this book, but it's too good not to share it. In addition to being an interesting book with tons of good info, it was incredibly well written, and the authors humor is spot on.